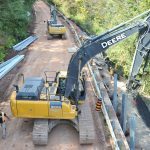 2017 was a transformative year for Bronte Construction. This year we experienced our largest internal team growth to date, we had an exponential increase in projects, we formed new divisions and expanded our services, and we were honoured to receive notable awards and certifications. As we begin the last quarter of the year, we want to thank our amazing team and share some of these tremendous highlights with you. Bronte Construction is excited to be ranked number 10 on the 2017 PROFIT 500 list of Canada’s fastest-growing companies. In 2017, we experienced significant client and project growth, we grew our business, and we added new divisions to enhance our services. We are proud to say that we expanded our environmental division, where we focus on our transparent and thorough project implementation process to ensure that, wherever possible, our work can proceed with the least amount of environmental impact. Our organizational growth allowed for the creation of an underground construction division, where we focus on utilizing new technology as a means to perform drill and shoring system construction with decreased cost and disruption. Overall, our growth enabled us to enhance our project implementation capabilities. This has allowed us to continue to improve on our concentrated efforts to provide thorough front-end examinations to reduce challenges and implement solutions, while mitigating against project creep — saving our clients both time and money. Canada has more than 350,000 construction firms, and Bronte Construction is proud to be one of only 200+ firms in Canada to receive the Certificate of Recognition (COR) from the Infrastructure Health & Safety Association (IHSA). Bronte Construction promotes ‘safety first’ every day at all our job sites, as the basis for achieving quality results. We are proud to be a part of a nationwide network participating in and promoting health and safety excellence. We thank our clients, our partners, and our team for this tremendously successful year — we couldn’t do it without you. Click here to learn more about Bronte Construction’s approach, values, and projects.